Description: The flowers are tubular, pendent, 1/4 inch (6 mm) long, and have 5 lobes and 10 stamens. Flowers and berries can be found on the plants at the same time. The berries ripen in the autumn and are orange, red, or reddish to bluish purple in color. The berries are an important food source for the Hawaiian Goose or Nene (Branta sandvicensis). The leaves densely line the stems and are leathery, oval-shaped, and up to 1 1/4 inches (3.2 cm) long. The leaves are quite variable and may be dull and fuzzy or shiny and smooth, toothed or not, and bright yellow-green to darker grayish green in color. New leaves are often colored bright red. The branches sprout from underground rhizomes. Ohelo 'Ai is found in open and disturbed areas like on lava flows above 2000 feet (610 m) in elevation. 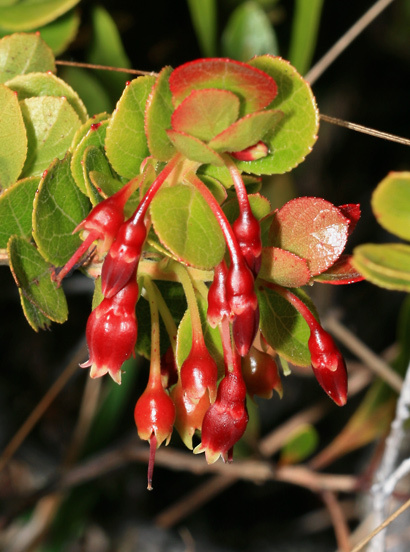 Two other, similar Vaccinium species are found here in Hawaii, but they both grow in wetter areas like rainforests and bogs. Ohelo Kau La'au (Vaccinium calycinum) is a larger plant with green flowers, less tasty berries, and larger leaves, while Ohelo (Vaccinium dentatum) has more sharply toothed leaves. 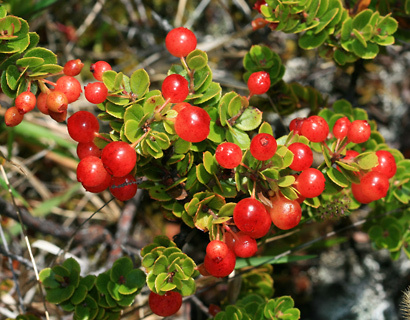 Edible – The berries are edible and quite delicious. 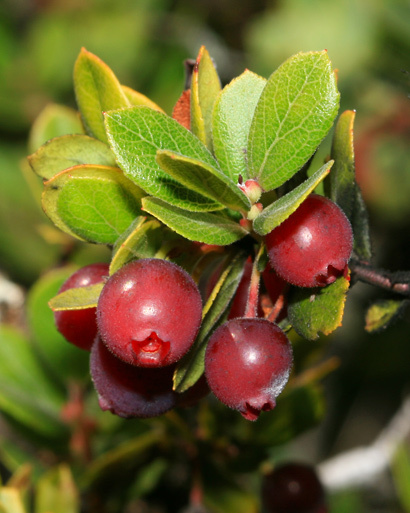 The fruit is tart like a sweet cranberry, and it can be eaten fresh or used to make jams, jellies, and pies.